On Nov. 2, Republicans in the U.S. House of Representatives introduced their tax-reform bill — HR 1, the Tax Cuts and Jobs Act — which would rewrite the tax code for the first time in more than 30 years. In anticipation of the bill's release, Emory University President Claire E. Sterk sent a letter Oct. 31 to Georgia's representatives in the U.S. Senate and U.S. House of Representatives outlining how possible tax reform measures could impact the university. Several potential reforms, including changes to endowments, charitable contributions and educational assistance, "would have a deleterious effect on Emory's students, employees and patients," Sterk noted. After reviewing the legislation that was released on Thursday, Emory is engaging with lawmakers on the negative impact to our students and the university as a whole, according to Cameron Taylor, vice president for government affairs. 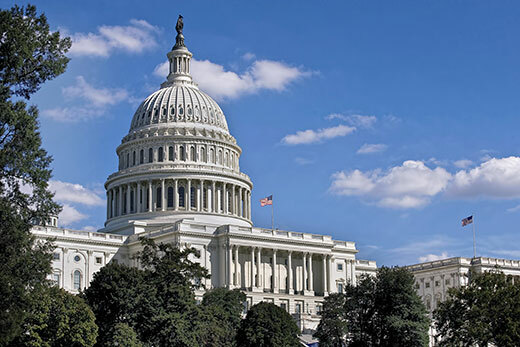 Additional provisions of concern include taxing student tuition benefits and eliminating the student loan interest deduction, as well as changes to tax-exempt bond financing mechanisms. "Emory will continue to express our belief that tax reform should not come at the expense of students pursuing the goal of higher education," Taylor says. The House is expected to quickly mark up the legislation. A version of the bill has not yet been introduced in the U.S. Senate. Tax-reform measures will ultimately have to be passed in both chambers, with differences reconciled by a conference committee, before being sent to the president's desk, Taylor notes. On Monday, Sterk discussed Emory's concerns about the tax-reform bill in a phone call with Sen. Johnny Isakson (R-Ga.), who serves on the Senate Committee on Finance, which will craft the Senate version of the bill. Along with individual advocacy, Emory is also working very closely with other Georgia institutions of higher education, as well as national higher education associations, to educate lawmakers on the impact of tax-reform proposals on colleges and universities. As president of Emory University, I write to share with you the impact of potential tax reform measures on our institution, which employs over 35,000 Georgians and is the second largest employer in Metro Atlanta. A number of the potential reforms, and in particular the proposals outlined below, would have a deleterious effect on Emory's students, employees, and patients. One vital tool in Emory's financial toolkit is our endowment. Over 1,900 donor-designated funding pools compose our endowment, and due to both contractual limitations and restrictions imposed under state law, Emory may use those funds only for the donor's intended purpose. As a large academic health center, Emory's endowment includes funds for both the educational and healthcare enterprises, including funds not only for student financial aid, but also for patient care, clinical research, faculty chairs, and undergraduate programs, among others. While some of the endowment funds are "unrestricted," in the sense that they were given without a specific donor intention, the vast majority of endowment pools are "restricted," in that Emory is constrained in expending those funds to fulfill the donor's intention. Our endowment, like that of other non-profits, helps Emory remain committed to its mission to create, preserve, teach, and apply knowledge in the service of humanity. Any effort to impede in the management of such an instrument, such as an excise tax or mandatory payout, will severely undercut our ability to fulfill donor wishes and ensure the endowment 's longevity and integrity. Core to the success of advancing Emory's mission is our ability to raise money through charitable donations. These donations come from various donors for a myriad of reasons. Some donors may give simply because they are alumni; some may give toward a specific initiative, such as providing financial aid for talented undergraduates or for treatment of post­traumatic stress disorder at the Emory Healthcare Veterans Program. Reasons motivating donors are varied, though donors give to create positive change. Charitable donations are critical to how Emory and other non-profits not only conduct business and raise money, but also advance societal goals. Altering the treatment of charitable donations could have a chilling effect on giving to all non­profits, including research institutions like Emory. A proposal to limit deductions to charitable contributions made in excess of two percent of a donor's adjusted gross income, may not pose a barrier to principal gifts donors, but it could have a deleterious effect on a donor pipeline. Likewise, an increase in the standard deduction, without some mechanism such as a universal charitable deduction, would affect the vast majority of taxpayers who would then have no incentive to make charitable contributions. Major giving begins with small annual gifts, and younger donors who no longer itemize because of an increase in the standard deduction would no longer have a tax incentive to donate money to charitable organizations. These financing mechanisms are core to the fabric of Emory University' s business, but are, by no means, the only ways in which many of the proposed tax reform measures could negatively impact Emory and other institutions of higher education in Georgia. Our ability to retain faculty and staff is strengthened by the benefits we can provide, including Section 127 employer­-provided educational assistance, which allows Emory to provide up to a set amount in tax-free tuition assistance at the graduate or undergraduate level for its employees, and Section 117(d) qualified tuition reductions, which allows Emory to provide tax-free undergraduate-level tuition waivers to its employees and their dependents. These provisions are particularly important in recruiting and retaining faculty and staff, and they offer employees a unique path to continuing education for themselves and their dependents. Changes affecting charitable giving and endowments, as well as those affecting educational assistance, will significantly impact the limited means of revenue used to support our students, patients, and staff. Thank you for taking these issues into consideration during the upcoming tax reform conversation. Please do not hesitate to call on me if Emory can ever be of assistance to you.